Product Description Base can opener are made from high-strength alloy stainless steel and TPR handle,the manual can opener has made unique design,extra sharp cutting wheel-extremely durable and heave duty,the stainless steel blade slices through the top of the can in one like butter,with out need excessive pressure.it can also used be as bottle opener,lever,beer opener and jar opener.no mater how the measure of the cans,it can be used. Suitable for special party, bar,home,BBQ. Item name: Can Opener,Bottle Opener. Product Size:8 x 2.5 x 2.4 Inches. Easy to clean and hang. Can open all kinds of cans. Perfect for party,kitchen, home,BBQ,bar to use. Step1 Turn handle clockwise to make the wheel as above. Step 2 Put the can opener onto the round can and please make sure it's vertical with can. Step 3 Turn the handle clockwise forward to can with some strengthen. Step 4 Turn back the handle clockwise to releade and get it.The lid will not fall into the can and is smooth without any sharp edges. Package:1 Pack Can Opener,Gray,tin opener Size:8 x 2.5 x 2.4 Inches.Ultra Sharp Blades:effortlessly slices and opens forming a smooth edge,ultra sharp blades guaranteeing perfect,efficient operation,every time! Premium Quality Material:Safety and health.Can opener manual is made of 18/10 food Stainless steel,100% safe! and soft PP plastic material soft grip handles and soft knob for easy and smooth maneuvering. 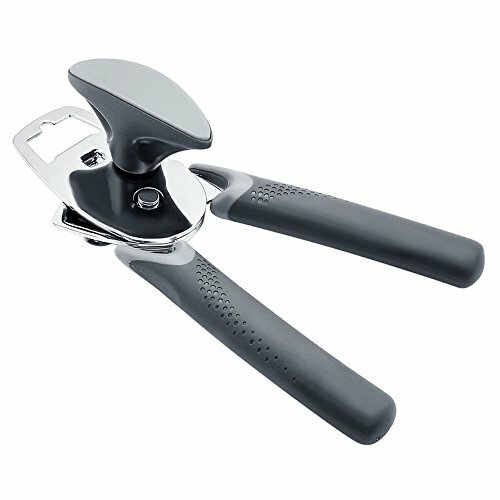 Multifunction Can Opener:3-IN-1 Multifunctional Can Opener,built in Bottle Opener and Lever,Stainless steel can bottle opener fits into any standard-size bottle.Can Opener smooth edge elegant Shape and designed specially for Home Kitchen,Baking room,BBQ,Bar and Restaurant. Easy to Use and Clean: This Can Openers can cut quickly, turn corners without going off track, equipped with sharp cutting gears and oversized knobs easily to relax your fingers, no n-slip long handle is rubberized for comfort and can open cans in seconds. Dishwasher safe or hand wash with warm water and a mild detergent, rinse and dry immediately. Rust-proof can opener for daily use. Lifetime Warranty: Beer Opener can provide lifetime quality assurance. if there is any problem with the manual can opener, please contact us, we will deal with it for you within 24 hours. We will refund your money or provide a new can opener manual as soon as possible. If you have any questions about this product by BASA, contact us by completing and submitting the form below. If you are looking for a specif part number, please include it with your message.